Enviroseal Digestate and Slurry Storage Bags are a temporary or permanent storage solution for all kind liquids including water, slurry, fertilizer, leachate and digestate. 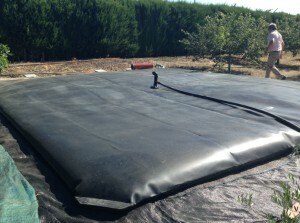 Digestate and Slurry Storage Bags can also be used as an additional gas store for anaerobic digestion. The Digestate and Slurry Storage Bag is made of ultra-flexible polyethylene membrane which is UV resistant with a selection of inlet and outlet valves to suit any requirement. Enviroseal Digestate and Slurry Storage Bags are easy to transport and only require a flat area for use so can quickly be deployed on virtually any site. The tank is delivered on a pallet and comes in sizes from 1,000 litres (220 gallons) to 500,000 litres (109,000 gallons). For European market Digestate and Slurry storage bags carry a CE mark.